Confused about the plethora of fermented beverages out there? Let’s break down two of the most popular: Kombucha and Kefir. Kefir and Kombucha are fermented beverages that use a SCOBY (symbiotic colony of bacteria and yeast) to ferment their base ingredients. Depending on the fermented beverage, the SCOBY has a more specific name. There are milk and water kefir grains and there are kombucha mushrooms. 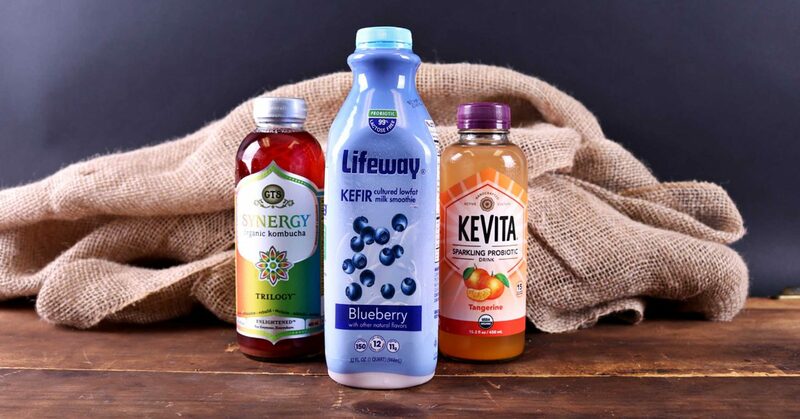 Kefir and Kombucha are rich in probiotics which are good bacteria that are found in our gut. Regular consumption of fermented beverages helps keep the gut in harmony, suppress the over growth of bad bacteria, boost our immune system, aid the body in absorbing and utilizing nutrients, and rid the body of toxins. Water kefir is a probiotic beverage made with sugar-water, fruit juice, or coconut water and mixed with water kefir grains. It is dairy-free, and the beverage is light, refreshing, and contains a billion live probiotics. Water kefir is an excellent alternative to sugary beverages, especially soda. They are low in sugar, effervescent, and loaded with probiotics! Milk kefir is a probiotic beverage made with cow milk, goat milk, or coconut milk and mixed with milk kefir grains. It is tart and even a bit carbonated and often called the champagne of fermented dairy. Often it is flavored with fruit, vanilla, and sweeteners such as honey, maple syrup, and stevia. Water kefir contains fewer strains of bacteria and yeasts than milk kefir, but they do contain far more than other cultured products like yogurt or kombucha. Both milk and water kefir’s probiotics are so abundant that they can colonize the gut with a host of healthy, good bacteria. This helps boost our immune system and aid in digestion, and especially important if you have taken a round of antibiotics. Kombucha is an ancient fermented tonic made from sweetened tea (black, green, white, or a combination of all three). The kombucha mushroom feeds off the sugar in the sweetened tea and creates a tangy, fizzy probiotic-rich beverage that is also an excellent alternative to sugary beverages. It is often flavored through a second fermentation using fruit, ginger, and/or herbs and spices. Kombucha is loaded with good bacteria and yeasts, digestive enzymes, and the powerful antioxidants that are found in tea!